Joel Garcia (Los Angeles, CA) is an artist, arts administrator and cultural organizer with 20+ years of experience working transnationally across the Americas. 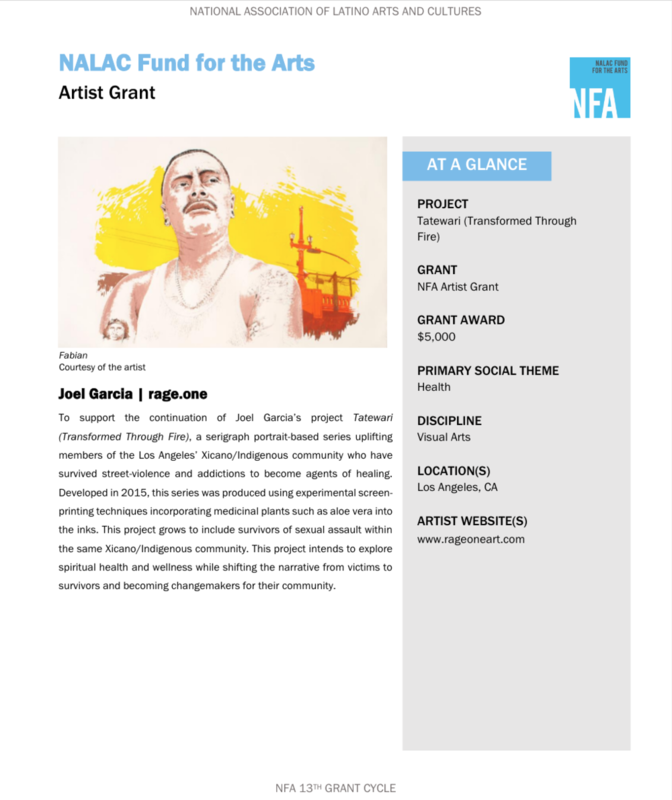 Joel is one of the recipients of the NFA Artist Grant which will support the continuation of "Tatewari (Transformed Through Fire)", a serigraph portrait-based series uplifting members of Los Angeles' Xicano/Indigenous community who have survived street-violence and addictions to become agents of healing. Toypurina Youth Arts & Action Workshop Series Dates: July 16 to August 16 (Tuesdays to Fridays, 10am to 3pm) Location: #Apachiagna (East Los Angeles) This (FREE) summer youth arts program is a 5-week art & activism workshop for youth 14-24, primarily those whose lives have been impacted by incarceration (their families or their own), punitive frameworks such as school suspension and expulsion, migration and gender constructs. 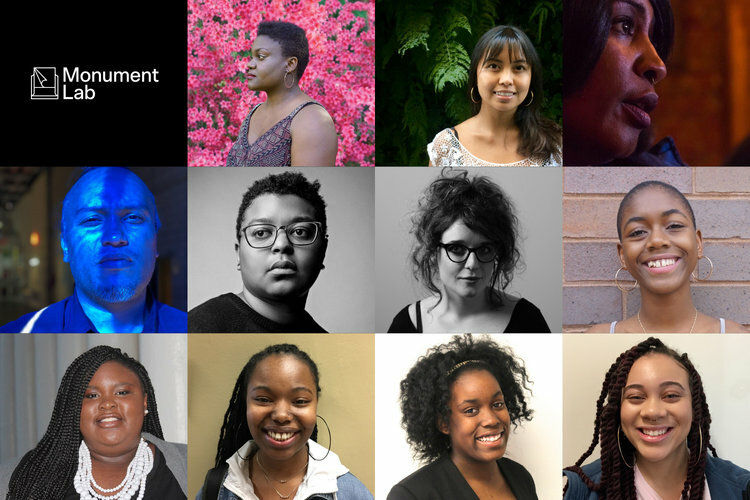 Youth will select 5 issues important to them and create arts-based strategies around, learn to strategize and create action plans, and fully implement each plan. Youth will learn about self-determination, sustainable creative practices through creating art and collaboration. Additionally, they will learn about and connect with artists who are active in their respective communities, especially Indigenous change makers. Youth will learn #screenprinting, #zinemaking, #stenciling, #muralism, and #wheatpasting as-well-as skill sets essential to the sustainability of movements such as marketing, narrative development, and facilitation of dialogue circles. Please DM us and we’ll send you the link to apply. + + + + + #Toypurina (1760–1799) was a #Medicinewoman of the #Tongva nation—a nation also known as the Gabrieliño-Kizh, due to their association with the Spanish mission San Gabriel. She is famous for her opposition of the colonial rule by Spanish Missionaries in California, and for her part in the planned 1785 rebellion against the mission San Gabriel, where she recruited 6 of the 8 villages which participated in the revolt. + + + + + About the name: for every iteration of this workshop series it will carry the name of an individual one who has become an ancestor, or a living person, in honor of their contributions to our liberation as a people. Let’s talk about #gentrification #colonialism #displacement and #climatechange - tomorrow at @avenue50studio ........................................ Current #ClimateChange efforts have spiked within less progressive circles so much so that the current Presidential administration has pushed back against this narrative. The push back and subsequent policies and actions such as withdrawing from the Paris climate agreements is primarily framed by Americans centering themselves and their experience within this context. Standing Rock and the #NODAPL struggle was triggered by white people deciding they didn’t want a pipeline running through their community and effectively pushed policy to move the pipeline into the Standing Rock Reservation. In short, Climate Change is now important because it’s affecting Americans. But this framework is flawed. We need to realize that there are places in the world that already live in a Post-Climate Change reality. A short drive south of #LosAngeles is the Cucapa community near the city of #Mexicali, capital of #BajaCalifornia where the agriculture industry in the #Coachella and Imperial Valleys have swallowed up the water from the #ColoradoRiver that used to empty into the Colorado River Delta. These humxn-made changes to the environment have caused flooding and droughts in the area going as far back as the early 1900s. This print captures a day during the moon-tides which take place between late February through early May in which the Cucapa community fish the delta and attempt to capture enough corvina fish to sustain them for a full year. After being #displaced and the ecosystem of land-based animals pushed to extinction levels, the Cucapa have been relegated to only fishing for survival while also being criminalized for practicing their ancestral traditions of fishing. Climate change efforts need to de-center both the American and humxn-experience and take leadership from #Indigenous communities already living in a Post-Climate Change reality. Joel Garcia is an artist, arts administrator and cultural organizer with over 20 years of experience working transnationally with artists and organizations across the Americas with a focus on indigenous perspectives. Joel uses art, design and organizing as a vehicle to carry forth issues facing indigenous communities and inner-city youth. Joel served as Co-Director at Self Help Graphics & Art (2010 - 2018) an organization rooted in printmaking and social justice. Under Joel’s leadership and through his experience, relationships in art-driven initiatives, community organizing and activism, SHG’s programs grew and garnered national recognition, and was recognized by President Obama’s administration. Projects he launched such as the Know Your Rights Poster Making Pop-Ups and JornARTleros led to supporting advocacy for vulnerable communities, Eastside artists, and low-wage workers such as street vendors, among other accomplishments. 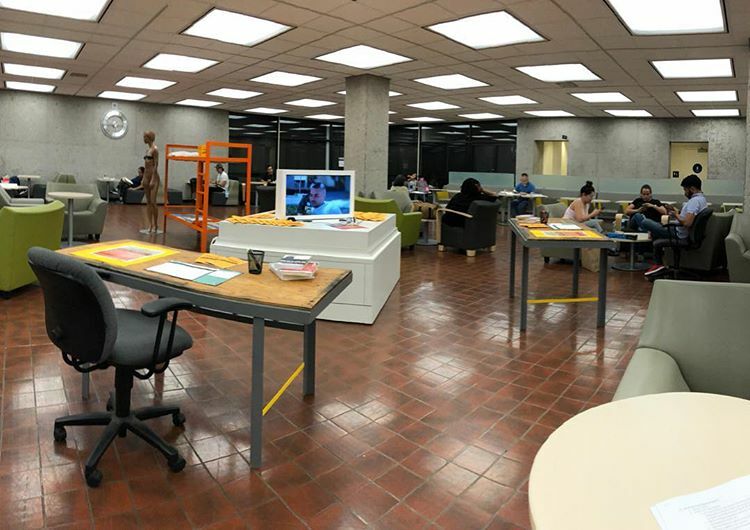 Joel designed and led the relaunch of the Barrio Mobile Art Studio, a mobile arts program under a social enterprise model employing and training artists. His advocacy and work with youth for a holistic approach to youth development have led to systemic changes in support of Boyle Heights residents. Furthermore, he has centered his work around Indigenous perspectives, as-well-as non-hierarchical, reciprocal, and anti-colonial practices, which has made it possible for SHG to be a host site for Indigenous-based events and mobilizations. As printmaker Joel has assisted with revitalizing the Professional Print Program by helping merge digital and analog techniques and pushing for more experimental processes. He developed various print projects, including key programs such as the Printmaking Summit (and related print portfolio) and most recently, the 45th Anniversary Exhibition and artist panel series, “Entre Tinta y Lucha: 45 Years of Self Help Graphics & Art,” at Cal State LA to strengthen Chicana/o and Latinx printmaking. Joel has worked with various movements and organizations locally and internationally such as the Dolores Huerta Foundation, UFW United Farm Workers, Tia Chucha’s Centro Cultural, The Getty, Japanese American National Museum, the Save Ethnics Studies Campaign in Arizona, Alto Arizona Campaign against SB1070, National Day Laborer Organizing Network, the Cucapa Campaign for Ancestral Fishing Rights among others. Additionally, he has worked with musicians and performers such as Grammy Award Winning The Black Keys, Grammy Award Winning Quetzal, Emmy Award Winning Eddie Izzard, among others. He has also booked music tours in North America, Costa Rica, Peru & Europe helping expand Chicano & Mexican Punk Music. In 2018 he was awarded the following fellowships; Wally Marks Leadership Institute for Change by the Liberty Hill Foundation, Rockwood Leadership Institute, Intercultural Leadership Institute, and the was recognized the Center for Nonprofit Management (Los Angeles). In 2019 he was awarded the Monument Lab fellowship, a national public art and history project based in Philadelphia and is a recipient of the National Association for Latino Arts & Culture Fund for the Arts. He recently presented a body of work at the Vincent Price Art Museum (July 2015) titled Tatewari focusing on generational trauma, masculinity, and tribalism. 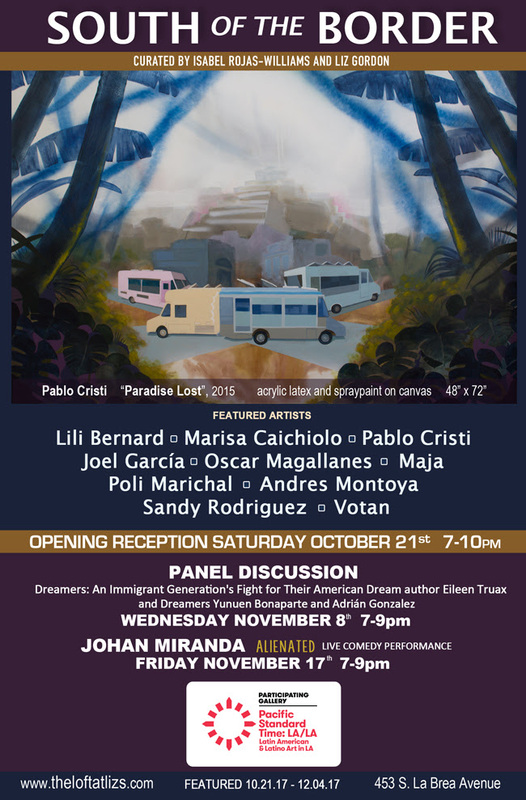 South of the Border is a fine art exhibition addressing the timely and controversial topic of immigration through the works of ten artists whose ancestral heritage connects them to several Latin American countries.